GSK-F1 is a novel potent inhibitor of PI4KA. GSK-A1 is a novel potent inhibitor of PI4KA. UCB9608 is a Potent, Orally Bioavailable PI4KIIIβ Inhibitor. 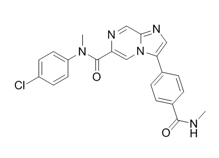 BQR695 is a potent and selective PI4K inhibitor. PIK-93 is a PI4KIIIβ inhibitor (IC50 at 19 nM).